Someone wants to get more furniture and install the FurniCraft addon (or similar), other players want more desserts and download the Sweet Desserts addon, but if you are one who wants a lot of fruit then drop below and download Fruits and Berries. 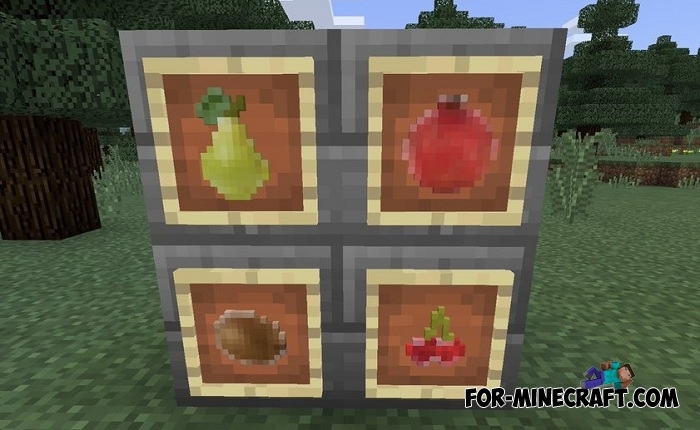 This small but realistic addon will diversify the range of available fruits in Minecraft PE. Due to the fact that Fruits and Berries is an addon you will not be able to find the fruits naturally in the worlds. To try the taste of each fruit, switch to creative mode or use the command: / give @s [red_flower/yellow_flower] [ID]. How to install the Fruits and Berries addon?